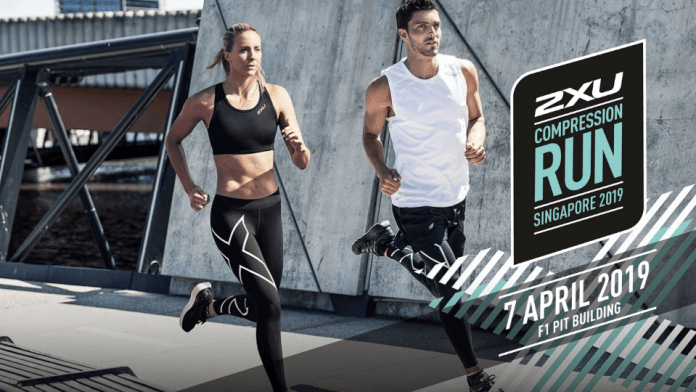 Race Review: 2XU Compression Run 2019 [21.1km] (by Jillian) | JustRunLah! This was my first half marathon. I was so worried about a DNF that I arrived early at the race village so I can join in at the first few waves for flag-off. You know… start at the front so you have some buffer time to fall back. But before that, let’s start with the race pack. This year’s race pack was really simple and minimal. Race singlet and timing chip. No sponsored products. I think there was a strip of actitape? Well, the colour scheme for this year (for the females) wasn’t as nice as the last but it still looked pretty good. Now back to the race day itself. There wasn’t any problems at the flag-off and the route was pretty good with no bottlenecks. That’s what I like about 2XU runs actually. Very well-planned routes. Everything was good with enough hydration points. But seriously, this has got to be the 21.1km run of pain for me. My first few km was hit with a side stitch. And when I slowed to regulate my breathing better and finally picked up the pace, I stepped on a tree branch near the grass area somewhere near Water Venture Marina(because it was too dark) and scratched myself. I have ‘pretty’ 5 parallel cuts at my ankle now. I washed it with water at the next hydration point before continuing down to Garden by the Bay East. So the pain was pretty much throughout the whole race until at the 15km mark, hunger pangs hit me. This was the worse. And I regret not reading up on fueling with energy gels. I thought I could have done the distance without supplements. I guess I was wrong. I had to walk the last 7km and that was when my pace took a dip and the nightmare of DNF came to haunt me again. Luckily my pace at the start of the race earned me some time and I managed to cross the finishing line after 3hrs 25mins. I was disappointed at myself mostly, for not reading up and doing pre-race fueling properly. Well, mistakes were made and I clearly underestimated the distance. I mean.. since I have so much fats at various areas, just burn them ya? Use all you want. But I guess not… Eating well before the race is still important. And I might consider experimenting with some energy gels to prepare me for my next 21K. So yup. Imagine my happiness when the volunteer handed me a banana at the finishing point. I was just happily munching away and drinking my Pocari Sweat. Everything turned out well and I changed into my finisher tee and headed for home. Good achievement accomplished! Just thought to share something with you. Perhaps having a good breakfast before the run, 2hrs before is good. Such as overnight oats or no sugar peanut butter or dark chocolate etc etc. And probably some caffeine is good. But remember to have some time to unload some “business” so 2hrs for me is good. You will have to experiment yourselves. Secondly, instead of gel, which is loaded with sugar, you can try medjool dates. But it can be slow to get into the body stream, and dry, so you need to chew and drink water to flush it down. Again you need to try and test it during your long run training just to test it out. whatever we do, we need to try it out way before our race, we do not want any surprises during the race! Hi! Thank you for your advice. You mentioned having medjool dates as midrace fuel. Do you also carry your own water during the run or do you wash it down at the hydration points? Yes, i carried my own water for my run. Not easy to carry one though, yet to find something that can help me carry my own squeezable bottle. I changed my usual bottle, and got sore thumb during the end of the races. Also, i mixed my owned water with 100+, just so that it is not too sweet. Refusing to use water bag because i can’t clean inside! Congrats on your achievement of running the HM. I recall doing this in 2015! Never underestimate this distance. 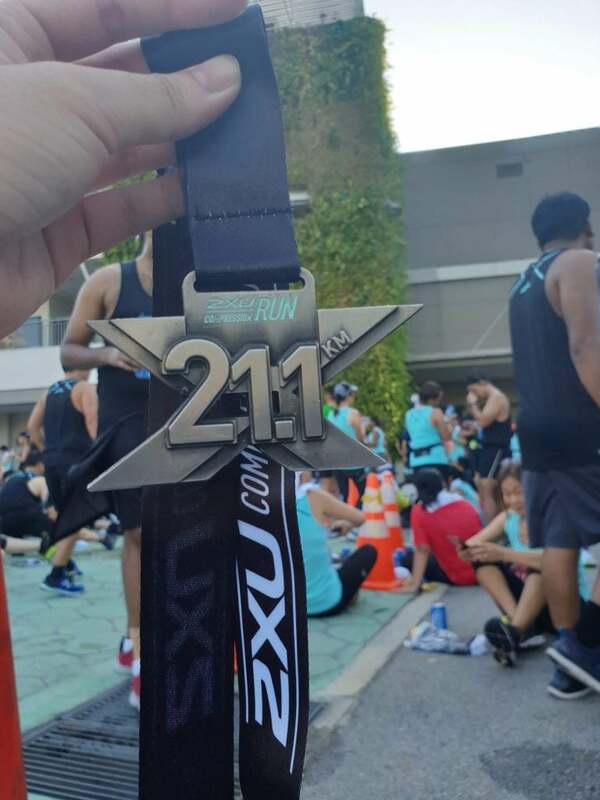 This year I went in unprepared and ended up almost one hour more than my first HM timing. One of those bad runs. Preparation for HM not only includes energy gels, good breakfast (previous comments) and also sufficient mileage in your training runs. Carry gels but no need to carry bottles, use the hydration pts. As a general rule, if you have to run more than 1.5hrs, having some gels for energy helps. You can check out my blog post here too, under Beyond 55. Congratulations on your first half marathon! Your first one will be quite unforgettable but will be the baseline for your next races so don’t worry about it. Good thing you still had fun. I also raced that morning and was part of wave 4. I agree that some places were dark and some too crowded for walkers and runners, but it was good overall. Good luck to your next races! You did not train enough – it’s as simple as that. They shouldn’t give out finishing medals for walking. It’s supposed to be a run. my 3rd yr running 2XU too. well organised race! thumbs up! still no race result. this event is not well organised.